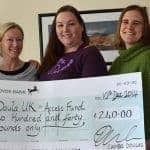 Doula UK is a non-profit association of doulas operating across the UK, many of whom regularly support women and their families with multiple births and postnatally. Its member doulas work with women and their families to prepare for the birth of their baby (or babies), helping them to fully explore their options, make informed choices during labour, and supporting them as they adjust to life with a newborn. A joint report released today by the Twins and Multiple Births Association (TAMBA) and NCT reveals shocking variations in the care multiple birth mothers and babies receive across England. The report found that multiple birth babies born in the South East and West Midlands receive the worst standard of care, whilst those born in the North East received the best care. It also found that each multiple birth baby is twice as likely to be stillborn as a singleton, and almost five times more likely to die in neonatal care. The latest figures from the Office of National Statistics (ONS) show multiple birth stillbirth rates rose by 13.6% between 2013 and 2014.